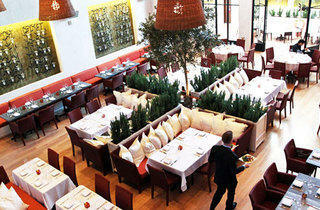 LA's flagship location of Fig & Olive appropriately bespatters each dish with a healthy deluge of specialty olive oil. Their fresh and flavorful menu, paired with bright, modern atmosphere make this West Hollywood eatery an 8,000 square foot delight. 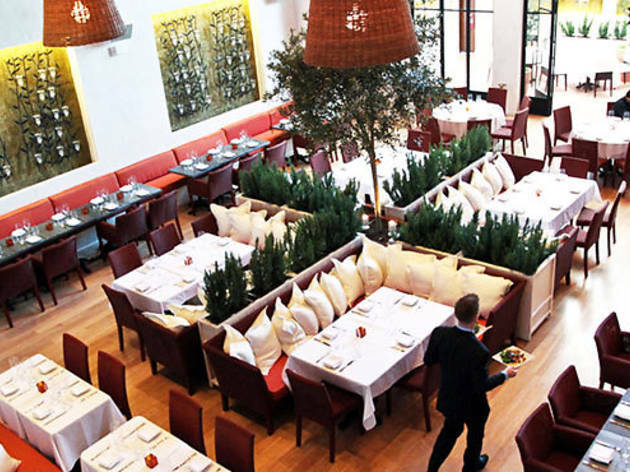 A two-story dining area, tasting bar and cocktail lounge occupy Fig & Olive's sprawling space, providing a fitting evironment for both intimate dinners and large scale affairs. The heavy pocketed among you can even rent out the entire restaurant for your private event. Reserve a few bottles of their $495 Krug champagne, and you can call your evening at Fig & Olive more than just an EVOO slick. I really liked the interior dining deco at Fig & Olive. It's a bright, well-lit atmosphere inside and they have a covered outdoor space for events & seminars (check their website for more information on renting the space for a seminar, it's a great venue). I recently came to Fig & Olive for a seminar event & they had us in the covered patio. Lunch was a set menu where we were served at the table (much better in this case than a buffet option), and the food was great! Light, fresh and healthy menu options. I tried the signature salad with figs & olives and the chicken breast, both of which were really tasty. I will be back to try their other menu options! PS: One note, the day we came, the womens bathrooms weren't locking. Be careful - you might get walked in on!